Today’s post is brought to us by our good friend Dontavius Williams. Recently we’ve had fun discussions in the email about the love some have for chitlins and the utter disdain others have for pig intestines. It was all fun and games until Don decided that they were going to cook chitlins at Brattonsville’s annual event, Hog Butchering Day. Check out his thoughts below! “There is perhaps no animal which the western farmer possesses, reared with so little trouble and expense, and which, at the same time, adds so largely to his comforts, as the hog.” These words penned by William Oliver were posted to Facebook by an interpreter friend of mine last week and caught my eye; as we were having Hog Butchering Day at our site last Saturday. Although Oliver was speaking of his experiences in Illinois when he penned these words in 1843, they still hold true today here in the Southeast. 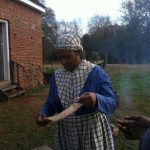 Pork was and still is one of the main sources of meat to the people of York County, SC. 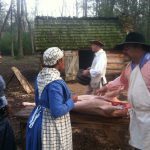 Two weeks ago, at Historic Brattonsville, we held a living history program centered on the ALMIGHTY PIG. It was or Hog Butchering Day event. I did not really take part in too much of the planning of this event; however, I was in on a couple conversations about how we would go about the day. Of course, living in 2013 we are somewhat disconnected as a society from HOW the food gets from the Farm to the Table. With that said, there was a bit of push back from some community members and even staff who did not want to have the hog actually slaughtered on site. Needless to say, when the word was passed down from the big guy in charge, we did not actually kill the pig on site. Honestly, I was a little disappointed because I was looking forward to the experience again. I remember, as a child when we would kill hogs, the entire community would come together and help with the process. As a reward for all of our hard work, we would each go home with a pound of sausage. Saturday was nothing short of the same experience for me. We had volunteer interpreters who came out and cut up the pig and preserved its pieces with salt which we will later smoke to add flavor and even more shelf life to it. Volunteers also made lye soap and lard from the fat of the pig. Everything with the exception of the oink was used on this day. Some cooking took place as well. 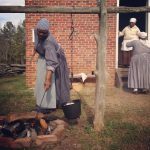 I helped to make chitterlings (affectionately known as “chitlins”) in the slave cabin. The camaraderie that was formed around the table was inexplicable; with that understood, there is something special to be said about standing around a table cleaning the innards of a pig with a group of friends. I had never taken part in the cleaning and cooking of chitlins; but Saturday was a great learning experience for me. You may be wondering, what the heck is a chitlin. Well, let me help you… chitlins (chitterlings) are the intestines of the pig. “GROSS” you may be thinking… not at all. J Chitlins have an acquired taste. Most people can’t get past the idea of the smell of them or the texture. But once you get the “guts” to try them, if you like them, they will change your life forever. Visitors young and old came up and asked questions, some repulsed by the idea, but many more intrigued and tempted to taste the finished product. Although the chitlins started out being one of the most repulsive things I had ever touched, they ended up being one of the most delicious dishes I have ever tasted. It’s funny how the “trash” of the pig can be used by people to create some of the most delectable dishes. After my Hog Butchering Day experience, I walked away with a better understanding and deeper appreciation for the pig. 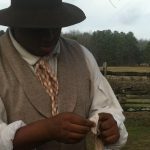 I was raised not to waste anything and this living history event reminded me of my teachings I received as a child. I can’t wait until our next event like this. Hope you can make it too.